3 different ways to order Karen's patterns! For Shop Owners - for Wholesale Order information, click here. Suggestions notions from Karen's online catalog: 1 yard each of two colors of Karen Combs' Serendipity fabric , value finders. The technique is perfect for Karen's SERENDIPITY fabric line! 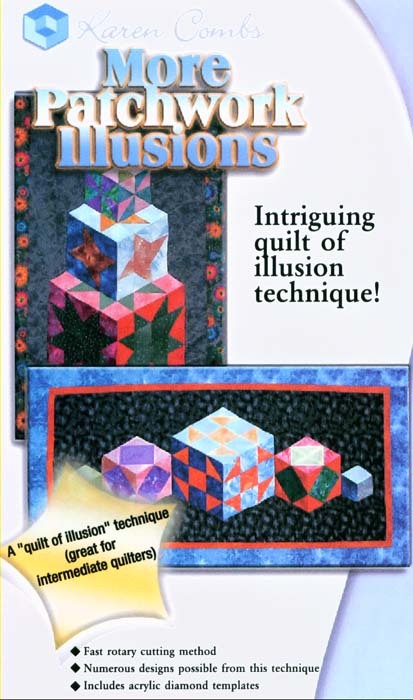 These rotary templates are used in Karen's online classes and in the Patchwork Illusions/ More Patchwork Illusions techniques as well as 3-D Ribbons, Christmas Cube, Stars Galore, Cube2, Celebration and Amazing Attic Windows patterns. Best value: order patterns without templates and order templates separately. If you already have Karen's templates, order the pattern without templates. A beautiful quilt with the illusion of depth. Don't let it scare you, the piecing is easy, just squares and triangles! Believe it or not, this stunning quilt is created with just one block! Created with three colors (pick your favorites!) in a light, medium and dark value of each color. Perfect for gradated fabrics or hand dyed fabrics! Instructions include cutting information for both Karen's Serendipity gradated and traditional fabric. A throw that can grow! Now available as a downloadable pattern at Karen's Etsy Shop! 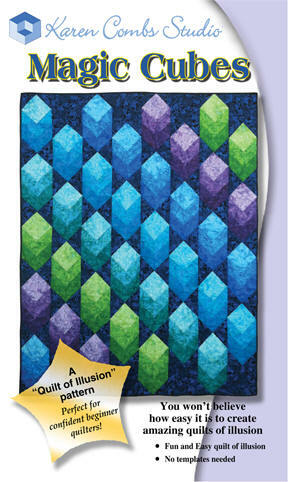 A beautiful quilt with the illusion of depth. Don’t let it scare you, the piecing is easy, created from just triangles! Believe it or not, this stunning quilt is created with just one block, done in different colors. Created using a light, medium and dark value of four cool colors. Perfect pattern for batiks, gradated fabrics or hand dyed fabrics! Pattern includes fabric selection, cutting and sewing information, and color layout. Quilt is 48" x 48"
Also available as a downloadable pattern at Karen's Etsy Shop! Candy Drops 42" x 60"
This throw is easy to make. Don't let the illusion fool you! If you can cut and sew triangles and squares, you can make this quilt! Pattern includes fabric suggestions, cutting tips and sewing diagrams. Perfect in the colors as shown or change the colors to fit your décor. Pattern includes fabric selection suggestions, yardage needs, full color cutting and sewing diagrams. 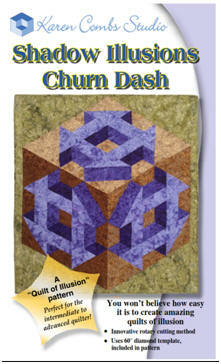 A new twist on Karen's Patchwork Illusions! 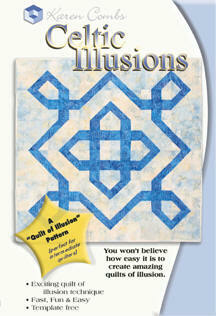 Perfect for the intermediate quilter or anyone who has taken Karen's Patchwork Illusions class! Pattern includes fabric selection, full color cutting and sewing diagrams. Also in includes Karen's 60° rotary template. Needed templates are included in the pattern. 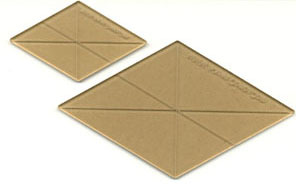 If you already have Karen's diamond templates, order pattern without templates. This intriguing optical illusion uses easy shapes to create its intriguing optical illusion. A throw that can grow to whatever size you need! 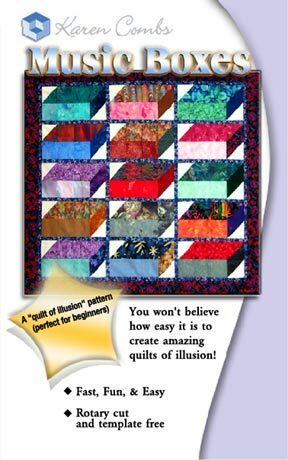 An amazing, yet easy quilt of illusion! Perfect for the confident beginner. Includes information for gradated fabrics, as well as traditional printed tone on tone fabrics. 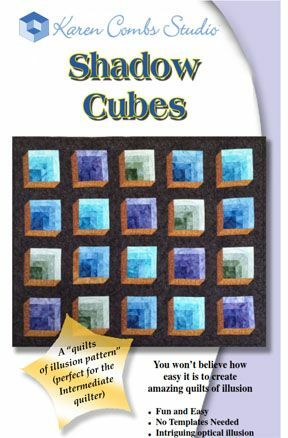 Shimmering cubes with a beautiful illusion of depth! Easy to piece and a perfect place to use gradated fabrics or your hand-dyed fabrics! A throw that can grow to any size you wish. Stars cascade across the surface of this stunning quilt. 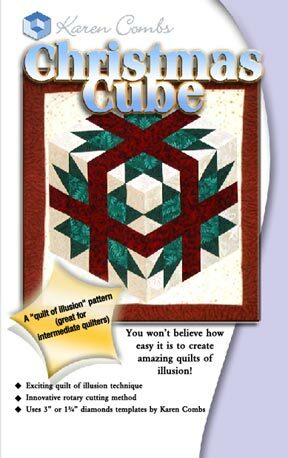 Fast and easy to make, perfect for the intermediate quilter. A perfect quilt to use your gradated or hand-dyed fabrics! A log cabin variation makes this contemporary looking quilt easy to piece and oh so fun to make! The elegant look is achieved by using cool colors found in nature. Perfect for the confident beginner. 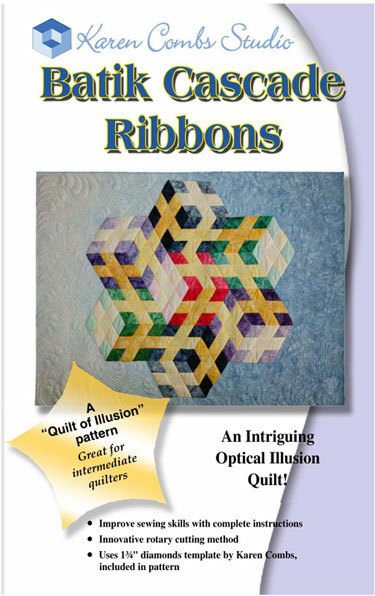 An easy quilt with an amazing illusion of motion and depth. Perfect scrap quilt for your tone on tone batiks or use your favorite basics. Fast and easy to make! Perfect for the confident beginner. Light, medium, and dark color values create an illusion of depth and dimension in the fun-to-piece center of this artistic wall hanging. Pattern includes fabric selection suggestions, yardage needs, full color cutting and sewing diagrams as well as Karen's 60° rotary template. includes instructions in two sizes! 48' x 48" and 76" x 76". A fun pattern, with colors that flow around the color wheel! Stars cascade across the surface of this beautiful quilt. Fast and easy to make, perfect for confident beginners. Includes cutting instructions for traditional fabric as well as gradated fabrics. This colorful scrappy quilt is made for batiks! Waves of color cascade across the surface of this quilt with a wonderful illusion of motion. Perfect for beginners! Pattern includes rotary cutting instructions, sewing information, and full color piecing diagrams. 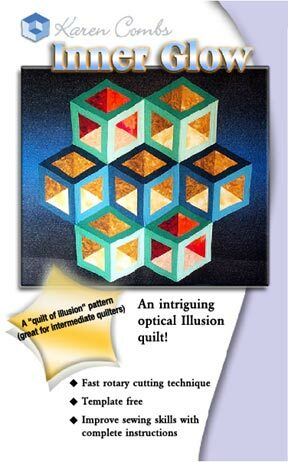 This amazing quilt has a wonderful illusion of depth. 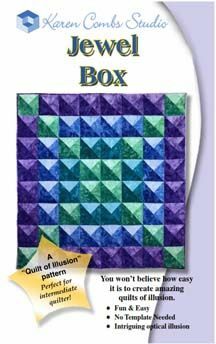 However, don't let the illusion scare you, this quilt is very easy to make with Karen's rotary template. Pattern includes rotary cutting instructions, sewing information, full color piecing diagrams and 60°diamond template. Colorful tulips cascade across the surface of this scrappy quilt with the illusion of motion. Perfect for beginners! Karen has developed a truly magical way to create pieced Celtic quilt. Let Karen share her secrets, so you can quickly and easily create an amazing pieced Celtic quilt. This amazing quilt has a wonderful illusion of depth. 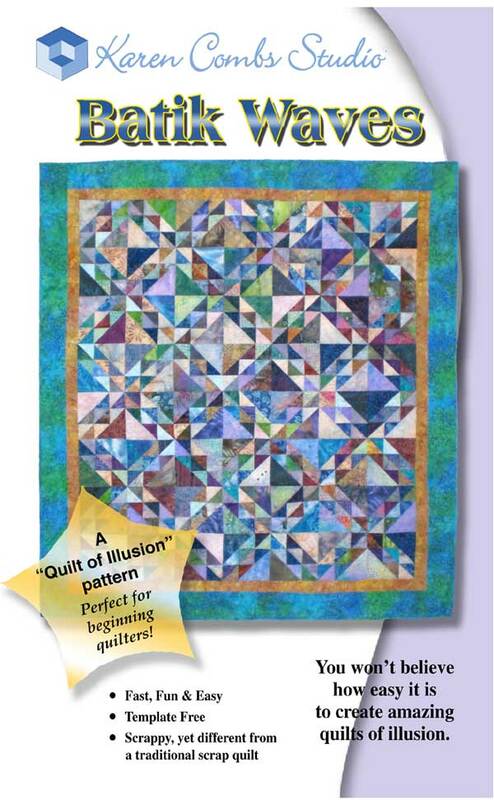 However, don't let the illusion scare you, this quilt is very easy to make with Karen's rotary templates. 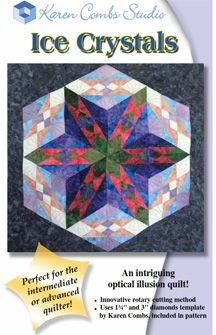 Pattern includes rotary cutting instructions, sewing information, full color piecing diagrams and 60°diamond templates. The quilt is perfect for Karen's SERENDIPITY fabric line! 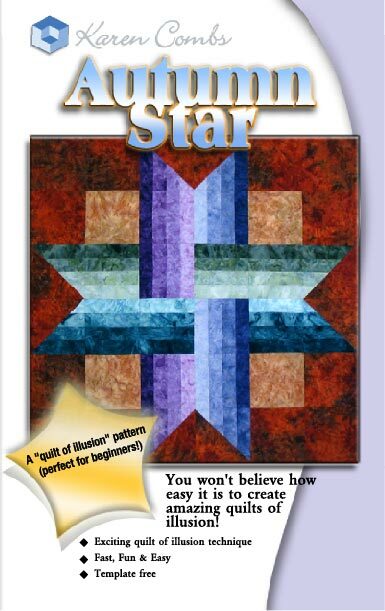 This pattern contains instructions for two different 3-D star quilts. 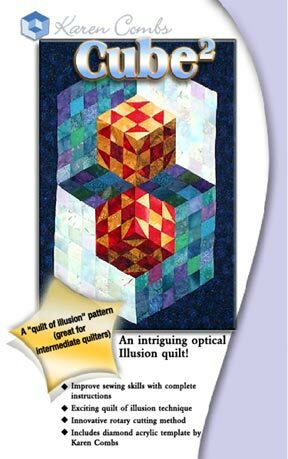 These amazing quilt has a wonderful illusion of depth. 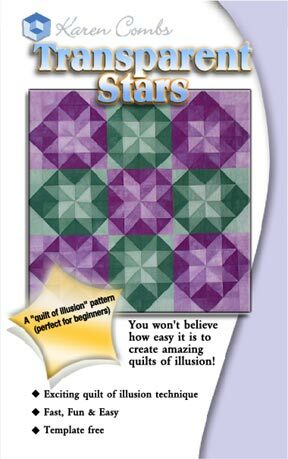 However, don't let the illusion scare you, this quilt is very easier to make with Karen's rotary templates. 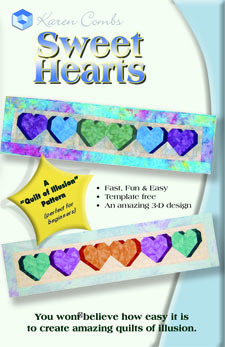 Pattern includes rotary cutting instructions, sewing information full color piecing diagrams and 60° diamond templates. 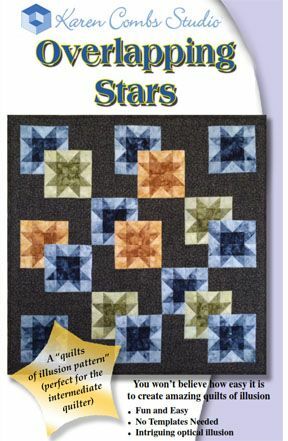 This amazing star quilt has a wonderful illusion of depth. 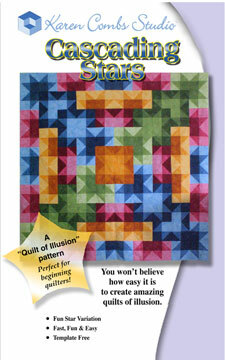 However, don't let the illusion scare you, this quilt is very easy to make with Karen's rotary templates. Pattern includes TWO sizes! Pattern includes rotary cutting instructions, sewing information, and full color piecing diagrams and 60° diamond templates. This amazing star quilt has a wonderful illusion of transparency. 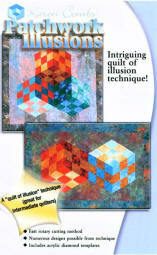 However, don't let the illusion scare you, this quilt is very easy to make! If you can sew half-square triangles, you can make this quilt. 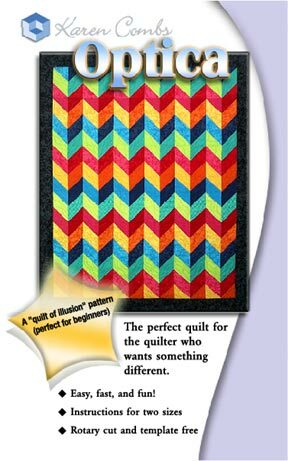 This bright and cheerful quilt has an amazing illusion of depth. 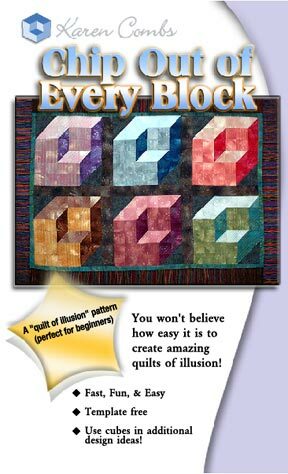 However, don't let the illusion scare you, this quilt is very easy to make! After seeing this quilt, you won't believe it is flat, you will want to touch it, it looks so real. Pattern includes rotary cutting instructions, sewing information, and full color piecing diagrams. Instructions for throw size as well as twin bed size. Okay, the name may be corny, but you will love making these fabric bricks into a wallhanging, throw or bed size quilt. 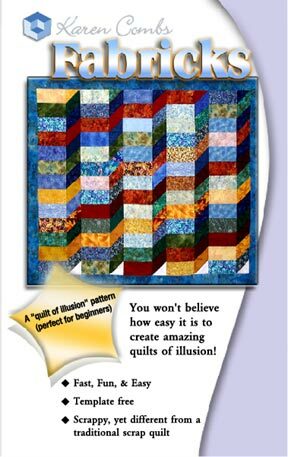 This quilt is easy to make, however the illusion of depth creates an intriguing and beautiful quilt. You won't believe it is flat, the quilt looks real! 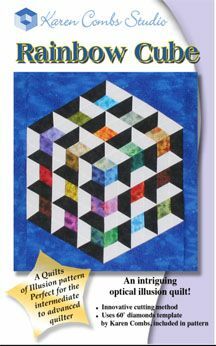 Pattern includes rotary cutting instructions, sewing information, piecing diagrams and quilting suggestions. Instructions for throw size as well as bed sizes, twin through queen are included. This quilt is striking as well as beautiful! The quilt really looks like it glows! You will love the strip piecing and rotary cutting techniques used to make this quilt. Pattern includes rotary cutting instructions, fabric and color suggestions, sewing information, piecing diagrams and quilting suggestions. This wallhanging is easy to make. Don't let the illusion fool you! If you can cut and sew triangles and squares, you can make this quilt! 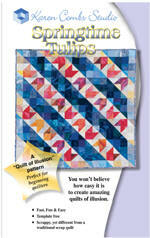 Pattern includes fabric suggestions, cutting tips, sewing diagrams and quilting suggestions. This wallhanging is easy to make. It uses rotary cut squares and triangles to create it's unique optical illusion. Pattern includes fabric suggestions, cutting and sewing information, design options and quilting suggestions. This wallhanging uses diamonds to create its intriguing optical illusion. 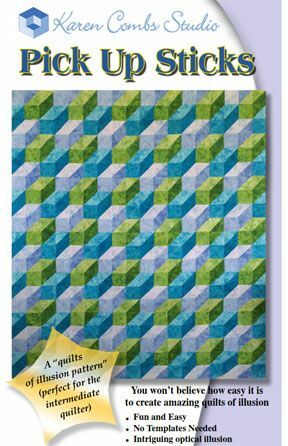 For the intermediate quilter, pattern includes cutting instructions, sewing tips, quilting suggestions and 60° diamond rotary template.